The best time to plant strawberries depends on the climate where you live. In warm and tropical climates the best time to plant strawberry plants is in the fall. Planting in the fall in these climates allows the plant to establish itself in order to produce a good crop in the spring. If you live in a cooler climate where the ground freezes in the winter, early spring is the best time to plant strawberries. Strawberries require 6-10 hours of direct sunlight each day and should be planted in a well-drained area. Raised garden beds tend to be a good option for strawberries. A site that has not had tomatoes, peppers or eggplant grown in the soil for at least 3 years is important. Strawberries like slightly acidic soil with a pH of between 5.5 and 7. If your soil is clay-like then generously add composted leaves, sawdust, or organic matter into the soil before planting strawberries. If your soil is sandy mix a 1 inch layer of rich compost into the soil before planting strawberries. If your soil is alkaline, then it will be best to plant the strawberries in containers with potting soil, rather than planting them in the ground. Prepare the soil a few months before planting the strawberries. When planting strawberries do not bury the crown, which is the central growing bud. If you bury the crown it could cause the plant to rot. The plant should be placed in a hole so the crown is just above the level of the soil. Strawberry plants need plenty of space to grow. Leave 4 feet between rows and at least 20 inches between plants. Strawberry plants have shallow root systems so they need moisture throughout the growing season. Drip irrigation systems are recommended to keep the soil moist but not too soggy to cause rot. 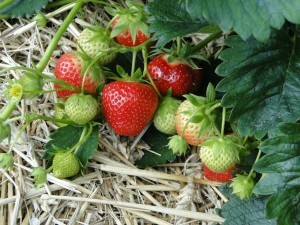 Straw, mulch, black plastic or even leaves should be used for ground cover surrounding the strawberries. The covering will help prevent weeds, will help prevent the soil from drying out so quickly and will protect the berries from sitting in mud. The first year you plant your strawberries, remove all the flowers from the plants so they can spend their energy on establishing a good root system. Once the growing season ends, cut down or mow the plants to 4 inches, removing all the clippings and weeds. Lightly fertilize the plants with an organic blend and then cover them with 4 inches of mulch. To keep the berry quality high plant new strawberry plants each year. Also read about When to Plant Fruit Trees. With spring finally here fresh berry season is just a few months away. In just a short time the sweet fruits will be available at the farmer’s market, road-side stands and grocery stores. Fresh strawberries are beautiful and delicious but they have a tendency of spoiling quickly. The normal shelf life for strawberries isn’t very long and though many families have no trouble finishing off a carton of berries in a couple of days, or even hours, sometimes you’d like the edible fruit to last a little while longer. The good news is that there is an easy tip that will help keep strawberries fresh longer, allowing you more time to enjoy them. The secret is vinegar. It might sound surprising but a mixture of water and vinegar can help extend the life of your fresh strawberries. The ph of vinegar helps to kill mold spores and bacteria on the strawberries. This mold and bacteria speed up the spoiling process of the fruit so killing them helps to keep the strawberries fresh longer. • Rinse strawberries under cool water and then place them in a bowl. • Allow berries to dry before placing them in a sealed container in the refrigerator. Line the container with paper towels which will absorb moisture extending the life of the strawberries. *Note: This washing solution will work with other berries as well including raspberries and blackberries.